A young mountain lion was let back into the wild Monday, a day after roaming into a Salt Lake City neighborhood and forcing dozens of families to stay inside their homes for hours. No people or pets were injured. But the hunt for the 2-year-old cougar caused quite a commotion. The neighborhood is just a few miles from the base of the Wasatch Mountains. "For some people, it's pretty traumatic. 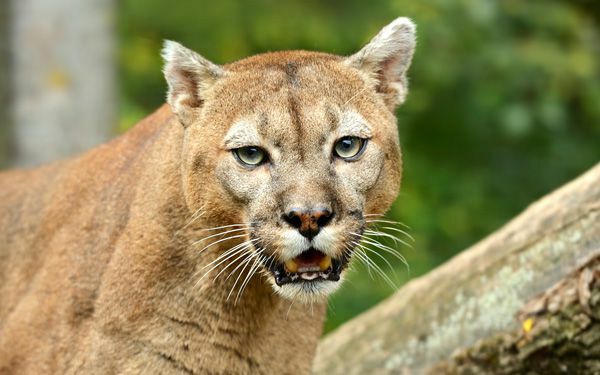 Other people get excited when a cougar visits town," said Scott Root, spokesman for the Division of Wildlife Resources. "It depends on your perspective." The cat first was spotted at 3 p.m. Sunday. Wildlife officials and police then set up a perimeter around four blocks of homes. A Reverse 911 call went out, telling people to stay inside while the search for the cougar continued. Officers searched backyards and talked to residents about what they had seen. Three hours later, they still hadn't been able find the cat. Then a resident called to tell them he saw it on a neighbor's driveway. Officials spotted it there, but it still took them nearly two hours to hit it with a tranquilizing dart. "Cougars kind of hole in nooks and crannies and the first one was a really tight shot," Root said. "We got it the second time." After being shot, she was found sleeping in a heavily wooded front yard, Root said. The cat, which weighs about 80 pounds, survived the night. It was released Monday in an undisclosed location in central Utah, he said. It was tagged so officials know if she comes back into the city. This was the second recent mountain lion capture in the Salt Lake City metro area. Salt Lake City sits between two major mountain ranges. In June, authorities captured a mountain lion that wandered into a shopping center in the suburb of Sandy. It was found hunkered down at the entrance of a steakhouse. Nobody was hurt, but the sighting spooked dozens of people arriving to work. Authorities say cougars generally avoid humans. But they sometimes enter neighborhoods close to their mountain habitats. The ones who wander into residential neighborhoods are usually young and often malnourished or injured, Root said. 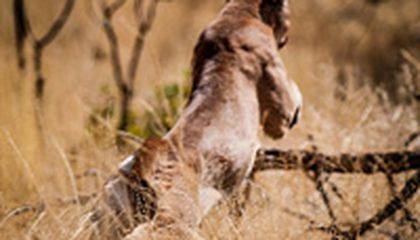 Critical thinking challenge: If the cougar was shot, why didn't it die? How can a piece of glass be a piece of art? The thing that has changed about when the cougar came into town. One of them is when the cat first came and they couldn't find it, nobody could leave there house until the cat was found. It took them hours to find the cat with all the spots a cat could hide. What if you didn't have food in your house? You couldn't eat anything for that period of time and it would be supper time by then. I'm sure some people were even sleeping at this time. Something that remained the same was, your family could do things together in the house for this period of time. I think if this is the second time this has happened, Utah has a cougar problem. There isn't much they can do about that, but it's a start. The cougar didn't die because they used a tranquilizer dart. The cougar was hit with a tranquilizer dart, and tranquilizer darts only put things to sleep, not kill them. On another note, this is a dangerous animal. I wonder why it was in Salt Lake City, and didn't stay away. The cougar didn't die because it was shot with a sleeping dart pretty much. So if it was to die it would be out in the wild. I'd be scared if I was there trapped in that house with a cougar outside. Having the cougar in those people's backyards must have been scary for them; that's a 2-year-old cougar that weighs 80 pounds. I think that would be scary if you see a cougar roaming around in your neighborhood. It's good that they captured the cougar. I wonder why it took them about 2 hours to shoot the cougar with a tranquilizing dart. "If the cougar was shot, why didn't it die?" That's a pretty.... not smart question. It says it was shot with a tranquilizing dart. They wouldn't shoot it with an actual gun, there would be no reason to. The story is all about a cougar who was loose in Utah. The cops should grab the cougar and put him back in the wild. The next time the cougar comes back, they could track him where he is. I think it. is very scary to see the cougar . I would not pet him. I I would be very scared to see a cougar.